A makeup artist uses the face as a canvas to create a particular look using cosmetics, enhancing features and working with color to correct skin tone and emphasize natural beauty. 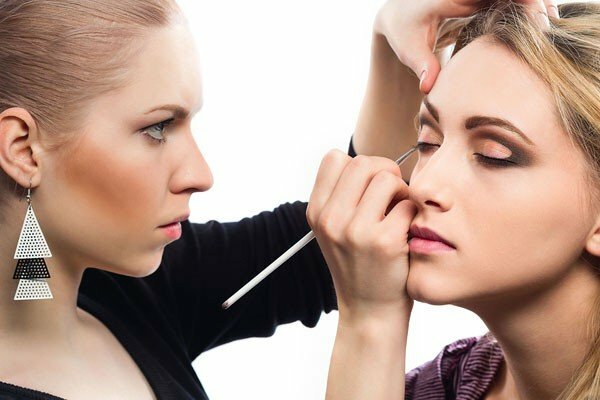 A trained and experienced makeup artist might work in a salon or department store, specialize in wedding and event makeup, or work in the fashion industry, television, film or theatre, applying everything from natural looks through to dramatic theatrical makeup. Makeup artistry is a creative career with a wide array of possibilities, and successful artists are able to use design skills, experimentation and products to create stunning looks. Makeup artists must keep up with fashion trends and product developments, and have an interest in skin science and beauty. With a cosmetology qualification from an accredited school and relevant experience, the job possibilities for a makeup artist are varied. Work in the salon industry is relatively stable, with jobs predicted to grow over the next decade by 14%. You might also work in a department or cosmetics store in product sales for a steady career. Jobs in other industries such as television, theatre and film are fiercely competitive, and there is no guarantee that even with training you will find regular work. Experience is essential to land this kind of job, and often a little bit of luck! An Esthetician qualification from a beauty school will give you a grounding in the fundamentals of skin care, from the science of healthy skin to professional makeup application. Want to know the three-word secret to becoming a great makeup artist? Practice, practice, practice! The more people you try your skills out on, the wider range of skin tone, complexion and face shape you’ll have experience of. Take photos of your work; its’ a good way to get used to how makeup translates to camera, especially if you’re planning on specializing as a makeup artist in film or television. Creating a portfolio is important when you are applying for jobs – for portfolio shots, it’s best to use a professional photographer, who will make sure your models look amazing, and your work is displayed to best advantage. Your portfolio should showcase different styles of makeup – beauty, experimental, simple and editorial. A cosmetology or esthetician qualification is a great start for your career as a make-up artist, but it’s your skill and experience that will get you the cream of the jobs. You could get a job on a makeup counter in a department store to gain experience in makeup application and products. Other ways to gain experience include working backstage in amateur theatre, or on student film projects. A makeup artist is just that – an artist. He or she needs to be able to create a variety of looks, from natural through to Avant Garde, using color, design and application together to make something beautiful. To apply makeup effectively, you’ll need to understand how someone’s skin tone relates to the color makeup you’re applying. Concealing red spots or dark blue shadows under tired eyes requires using opposites on the color wheel – so you’ll need to know your color wheel inside out! A cosmetology program at beauty school will teach this information. A makeup artist works extremely closely with clients for sustained periods, from initial consultations through to application. An important component in stressful and time-sensitive working situations, such as the preparation for a wedding, or a studio, a makeup artist needs to be a great listener, a good communication, and a friendly, efficient person. If you’re planning to work as a freelance makeup artist, you’ll be running your own business. You’ll need to be confident with setting your rates, keeping your books, invoicing and paying your taxes. Confidence with figures is important if you are working in television, theatre of film, as you will be required to stick to a budget, planning your work and keeping costs under control. Whether you’re working in a salon or as a freelance makeup artist, being punctual and organized is essential. You are likely to be working in stressful, time-pressured situations where keeping to schedule is an important part of the job. If you’re working on a makeup counter, turning a demonstration into a sale is essential. You’ll have to be friendly, personable and be able to talk about the products enthusiastically with good knowledge, and give advice suited to your customer. Being on your feet all day as you work requires physical fitness and stamina. Makeup artistry is hard work, and you’ll need to look after yourself to stay healthy, and make sure you get plenty of sleep and exercise. You will need to build up a makeup kit, which can be quite a substantial investment when you start out. You don’t need a huge array of products at first, but invest in quality, especially with your tools. The basics might include a foundation palette for different skin tones, an eye shadow palette, lipsticks, blush, face powder, black eyeliner and mascara. You can assemble your kit from your favorite brands, or save time and possibly money by buying a pre-assembled kit. 1. Instead of spending money buying lip liner, use eye shadow applied with a brush and covered with lipstick. Works just as well! 2. Use a fluffy brush as an angled brush by squashing the bristles flat with your hand. 3. Apply foundation over the lips before applying liner or lipstick – this removes uneven tones.